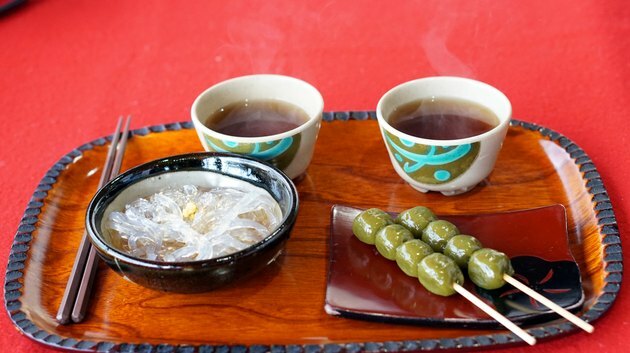 Kanten is a traditional Japanese food made from a type of seaweed. Kanten is called agar agar in the United States. It was originally made from one seaweed, Gelidium, and dried in snow, but the Tokyo Foundation notes that modern kanten is more often made from Gracilaria seaweed. It is available in powder and flake form, and Asian markets often carry the bar form. Despite claims that kanten is calorie-free, the USDA notes it does have calories, just a low amount. 100g of dried kanten has about 306 calories, but keep in mind that only 1 to 2 tsp. might be used at any one time, and in recipes that possibly make more than one serving. 1 to 2 tsp. is only about 4 to 9g, which would have between 12 and 28 calories. Spread that out over a few servings, and the resulting amount of kanten in each serving doesn't add a lot of calories at all. The USDA says those 100g of kanten have 7.7g of fiber, or around 0.5g per 1 to 2 tsp. The way in which kanten is supposed to help you lose weight is twofold: The fiber -- even though it doesn't seem to have much -- reportedly fills you up to the point that you don't want to eat as much food, and the kanten itself is low in calories, so what you do eat doesn't add much to your daily totals. Other health claims attributed to kanten include more regular bowel movements and lowered cholesterol. Dieting with kanten is fairly non-structured; there's no strict schedule for eating it. The only advice that could be considered an instruction is to possibly have some before meals or as a dessert, or to use kanten to thicken soup. Kanten is often used in gelatin-like recipes in which it is mixed with fruit juice, boiled and left to set. The kanten actually gels at room temperature instead of requiring refrigeration like gelatin. Sugar isn't necessarily needed in the recipes. Chia Joo Suan, writing on the website of the "Malaysia Star," suggests eating some unsweetened kanten before a meal. The modern diet claims seem to be based on one Japanese study from 2005, published in "Diabetes, Obesity & Metabolism." The researchers looked at two groups of overweight, type-2 diabetics, placing one group on a regular diet and the other on a kanten-supplemented diet for 12 weeks. The kanten-supplemented group had more weight loss, lower fasting glucose levels, lower blood pressure and lower cholesterol levels than the non-kanten group. One company, Penn Herb Company, Ltd., warns kanten that isn't eaten with enough fluid can swell up in your throat or esophagus. The packaging of the kanten you buy should have instructions on how to prepare the kanten given its particular form. Because of this possible choking hazard, ensure any recipes you choose to try are from reputable sources. What Are the Benefits of Amla Murabba?